Are you looking for a lightweight option that allows you to lead an active life while simultaneously satisfying your oxygen demand due to your respiratory disease? 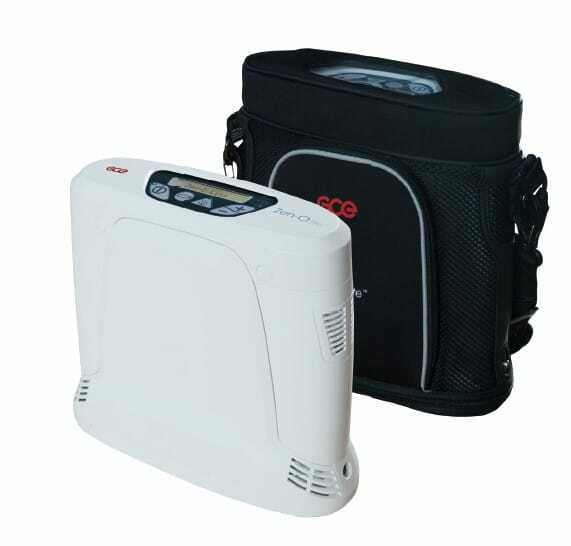 We are extremely excited to bring you the GCE Zen-O Lite portable oxygen concentrator. 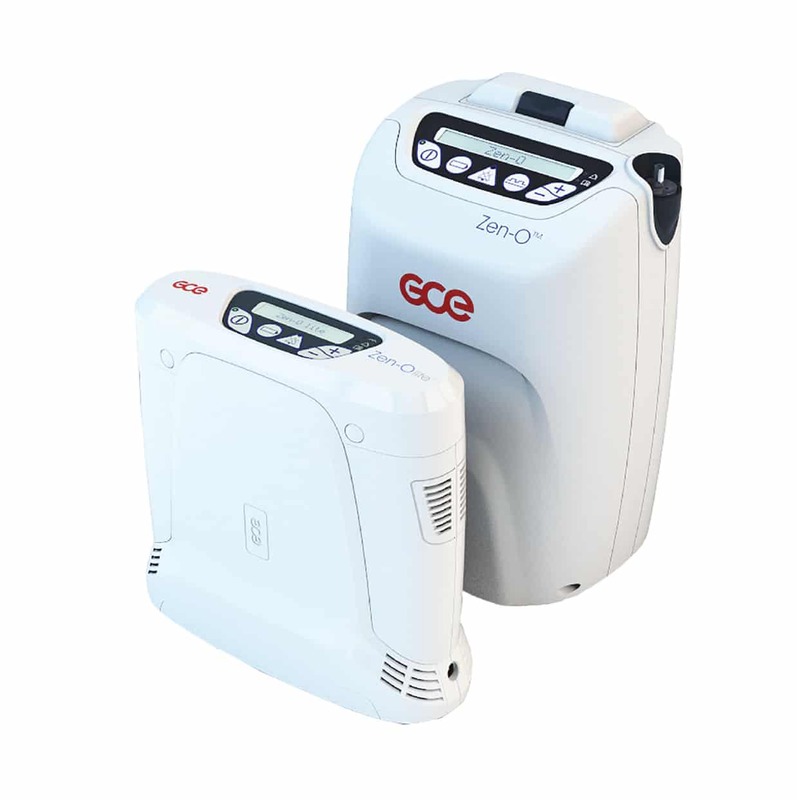 You may have heard of GCE from their other popular oxygen concentrator, the GCE Zen-O. 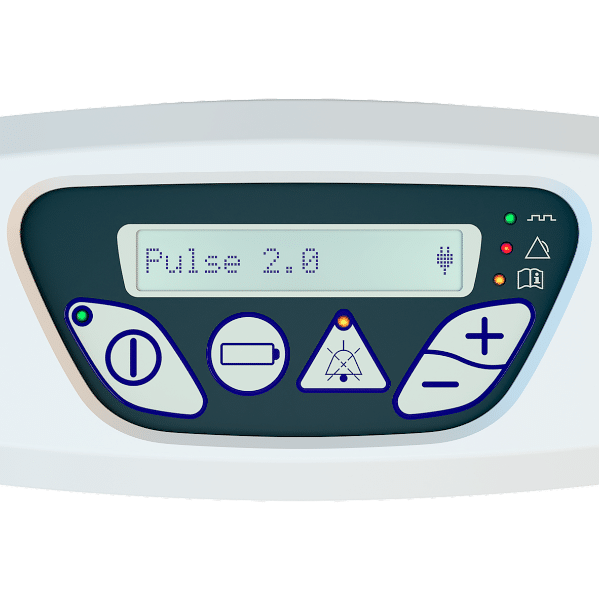 But unlike the GCE Zen-O that offers both pulse and continuous flow settings, the Zen-O Lite offers strictly pulse flow settings of up to 5 and is clinically validated for 24/7 use. Furthermore, as mentioned in the name, the Zen-O Lite is the lightweight alternative to the original Zen-O with a lightweight design of 5.5 LBS including the battery. The GCE Zen-O’s flow settings and weight may have been what deterred you from the device, but the Zen-O Lite weighs 5.5 pounds with the battery installed, and is something you will want to highly consider if you require pulse flow settings of 1-5. Plus, the Zen-O Lite offers 0.5 incremental adjustments for a more precise delivery of medical grade oxygen. Completely satisfy your respiratory demand with up to 1050ml of medical grade oxygen in a bolus (pulse) dose of oxygen per minute. The wide range of pulse delivery of oxygen mean you can adjust your flow rate as needed for varying forms of activity that require different levels of oxygen. But remember, only adjust your oxygen delivery as told by your doctor. For example, you may require a lower pulse flow of oxygen when resting than you would while say exercising. Technology is supposed to be our friend but sometimes the level of difficulty to use it makes you want to scream! This is certainly not the case with the GCE Zen-O Lite. GCE wanted to make the operation of this medical device to be as easy and straightforward as possible. And they fully delivered on that goal! Only must have features were included in the device to streamline the operation. The control panel features intuitive button operation with a crystal clear LCD display that’s easy to read, even if your vision has declined! When looking at the control panel you will see a mere 4 buttons. Which include a button for powering the Zen-O Lite on/off, a battery gauge button, a button to silence audible alarms, and +/- buttons to adjust your flow rate. Once you power the GCE Zen-O Lite on you will immediately appreciate the gorgeous LCD display. Which will show you the pulse flow setting you are currently using to ensure you are receiving your prescribed amount of oxygen. Furthermore, you can quickly check your remaining battery life percentage while on the go by simply pressing the battery gauge button. This will display the percentage of battery life remaining. What good does a portable oxygen concentrator do if you can’t get out and enjoy your freedom and independence? 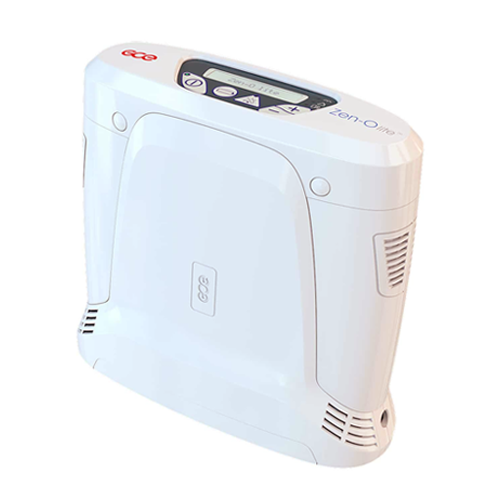 Battery life is often one of the most important features of a portable oxygen concentrator for respiratory patients. If battery life is important to you, then you will absolutely love the long lasting battery life of the GCE Zen-O Lite. In fact, with each GCE Zen-O Lite package you will receive 2 8-cell batteries that provide up to 4 hours of portable operation on a setting of 2. While enjoying your newly restored independence, remembering to monitor your battery life can slip your mind. But you don’t have to fear as the GCE Zen-O Lite offers multiple methods of recharging your batteries both at home and on the go! Typically, when you’re at home the standard method of charging you will use will be with the AC power supply. Which is where you plug the AC power supply into one of your home’s wall outlets. You can use the GCE Zen-O Lite on all 5 pulse flow settings without interrupting the overall charging cycle, but it’s important to mention that this will extend the time it takes for the battery to fully charge. The other included option for charging is for when you are on the go! The DC power supply gives you the ability to charge your GCE Zen-O Lite in your car, truck, SUV, R.V., or boat through the cigarette lighter outlet. And yes, you can use your Zen-O Lite on pulse flow settings 1-5 without disrupting the charging cycle. But just like with the AC power supply, using the oxygen concentrator while charging will prolong the charging cycle. Since you will be provided with 2 8-cell batteries, it only make sense to have an external charging option. Although it requires an additional purchase, the GCE Zen-O Lite external battery charger means you can always have your additional battery charging on the side. Enjoy the ability to go anywhere you’d like with the GCE Zen-O Lite without the worry of disrupting others around you. Whether you’re in the library or at the movie theater, the GCE Zen-O Lite delivers a sound level of a mere 38 dBA. Making the GCE Zen-O Lite even quieter than the Inogen One G3. Sending in your oxygen concentrator for repairs means you go without your medication or you are required to find a temporary replacement. GCE recognized this, and allows you to replace the GCE Zen-O Lite’s sieve beds at home in under 5 minutes… seriously it’s that easy! 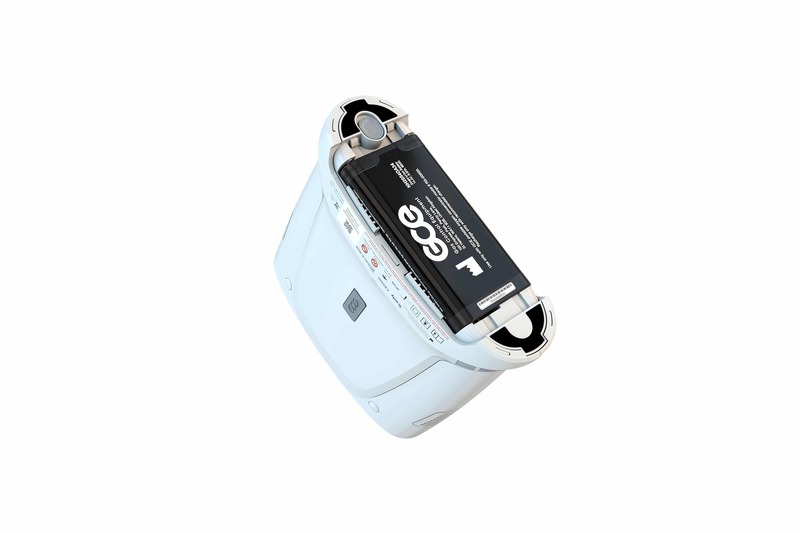 To provide you with peace of mind, the GCE Zen-O Lite features both audible and visual alarms when action is required. Some of the alarms include low battery, service required, and no breath detected. Another extremely important notification that the GCE Zen-O Lite provides is the breath detector indicator. Which is a flashing indicator that notifies you that oxygen is being delivered each time your breath is detected. Enjoy a supreme level of comfort while simultaneously protecting your GCE Zen-O portable oxygen concentrator from drops, bumps, and dings with the GCE Zen-O Lite custom carrying bag. The custom carrying bag features an adjustable shoulder strap to allow for hands-free operation. The carrying bag also features a control panel cutout with a protective layer of plastic, to provide quick access and setting adjustments and protection from the elements while out and about. The carrying bag features an oxygen outlet cutout for seamless cannula connectivity, access to the charging port, and a zippered bottom to allow obstruction free access to the battery on the bottom of the GCE Zen-O Lite. You also do not have to worry about your Zen-O Lite overheating in the carrying bag, which features precisely placed ventilation near the concentrators vents.